UConn Health neuroscientist Stephen Crocker wants to better understand progressive MS so that new treatments might be found. 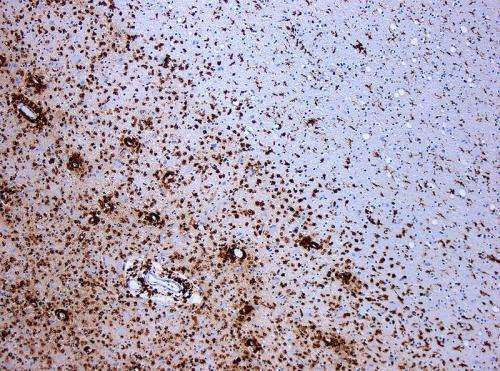 In the past, he and his colleagues had shown that the brain stem cells from people with primary progressive MS prevent oligodendrocytes, the cells that form myelin, from maturing. It’s something the brain stem cells are doing and it was likely why people with primary progressive MS never have remissions—the insulation around their nerve cells never gets repaired. And the team found that not only do the brain stem cells from primary progressive MS patients look older—they also act older. An analysis done by Paul Robson at the UConn—Jackson Laboratories for Genomic Medicine Single Cell Center showed that oligodendrocytes exposed to the patients’ stem cells start expressing different genes. This may explain why the myelin is compromised. “This protein actively blocks the ability of oligodendrocytes to mature. We did not know that before. 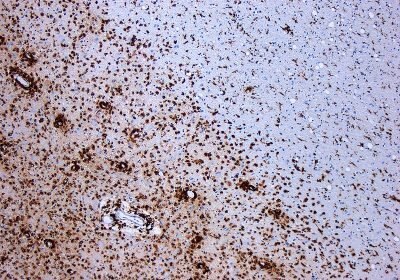 It had been found in lesions, and it has been associated with inflammation, but it was thought to be just exciting the immune system. Now we can see if we block that protein, we dramatically improve the oligodendrocyte’s growth,” Crocker says. Crocker’s lab also found that treating the brain stem cells with rapamycin helped the cells develop normally. Rapamycin is a drug that can be used to suppress the immune system. Rapamycin had already been tested in relapsing-remitting MS patients and found not to help. But it might help patients with the progressive form of the disease. “Recent studies have shown that drugs designed to target aging processes such as senescence may slow the onset and progression of many different chronic diseases, including cancer, atherosclerosis, stroke and Alzheimer’s disease, for which aging is a major risk factor. This work could have a great impact on the clinical treatment of MS since it opens up an entirely new direction to explore as a possible approach to slowing the progression of the disease,” says George Kuchel, director of UConn Health’s Center on Aging.